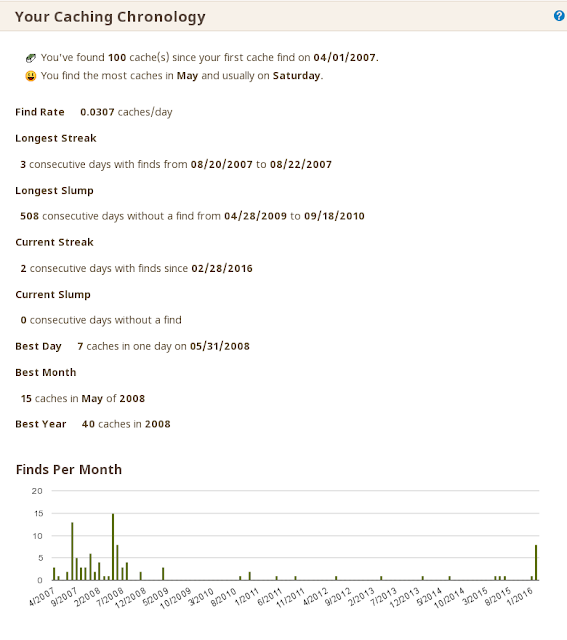 So I've been geocaching since April 2007, and I just now hit 100 caches. Wait a second...that's less than 9 years, and the title says 10 years -- how'd that happen? Well, I've found at least one geocache in each calendar year 2007-2016, inclusive. Ten different years, comprising 100 geocaches. That's unusually slow. How slow? My average find rate of 0.0301 caches/day puts me 8686/8718 on the mygeocachingprofile.com list. Actually, my rate is up to 0.0307, which would be good enough for 8682, but you can essentially only update your stats there every three days, and I updated mine when I hit 98, the day before I hit 100. Either way, more than 99% of the people who care enough to upload to that site find caches faster than I do. 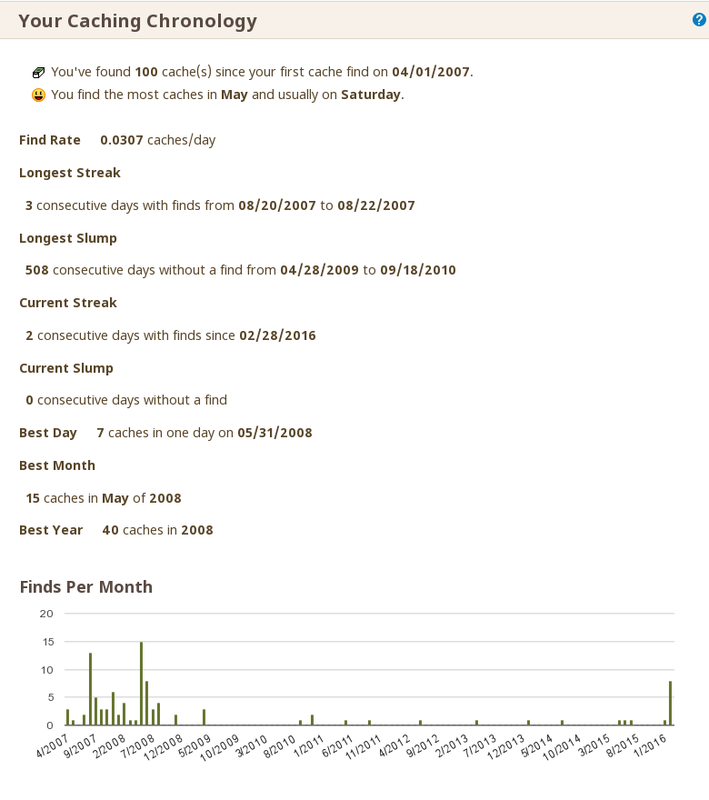 Before I get to a defense of my "slow caching" (it's like "slow food" but with Tupperware containers instead of food), I wanted to mention that I just noticed that Geocaching.com itself has stats. While they're not as extensive as other sites, they are instantaneously updated, which is a plus. So here's (part of) how I got to 100 caches. Here's one advantage of getting to 100 caches so slowly. I've never felt I "had to" find a cache. I always keep it in the back of my mind as a fun potential activity. In fact, until Leap Day, I had not found more than one in a day since 2008. And my Leap Day activity was all done while grabbing lunch. But I've found exactly 1 cache in each of Singapore, Estonia, Turkey, Austria and Puerto Rico. I can remember each of them distinctly, but for each of them I felt a sense of satisfaction, and was then ready to move on to other parts of my trip. As you can see from my chart above, I've gotten a little bit more active this year, so my rate will undoubtedly creep up. But if I take until the 2020s to hit 200 caches, so be it.